These lights and marks are prescribed across the world by the International Association of Lighthouse Authorities (IALA). In 1977 this IALA endorsed two maritime buoyage systems putting an end to the 30 odd systems existing at that time. Region A - IALA A covers all of Europe and most of the rest of the world, whereas region B - IALA B covers only the Americas, Japan, the Philippines and Korea. Fortunately, the differences between these two systems are few. The most striking difference is the direction of buoyage. During daytime, the identification of aids to navigation is accomplished by observing: location, shape, colour scheme, auxiliary features (sound signals, RACON , RC , etc) or markings (name, number, etc). Colour: Either white, red, green or yellow. If no colour is stated in the chart, default is white. Period: The time in seconds needed for one complete cycle of changes. The arrow indicates the 10 second period of this flashing light “Fl(3) 10s”. The duration of the light is always less than the duration of the darkness. The frequency does not exceed 30 times per minute. Again, the duration of quick flash is less than the darkness. The frequency is at least 60 times per minute. This Light has equal duration between light and darkness. A period consists of both a light and a dark interval. Also called Equal Interval (E Int). This is actually a combination of two patterns in one period. In this example the first 2 flashes followed by the pattern of 3 flashes result in: Gp Fl(2+3). Occulting is the opposite of flashing, the light is more on then off. An alternating light changes colour. This special purpose light is typically used for special applications requiring the exercise of great caution. In this example ALT.WG is shown, alternating between green and white. This light shows two flashes and a longflash, which is equivalent to the letter “U” in Morse code. This light has one long flash in a period. A long flash is at least 2 seconds long. All lighted aids to navigation are either major or minor lights, where major lights are used for key navigational points along sea-coasts, channels and harbour and river entrances. These lights are normally placed in lightships, lighthouses and other permanently installed structures, providing both high intensity and high reliability of the lights. Major lights are then subdivided in primary lights (very strong, long range lights used for the purpose of making landfalls or coastal passages) and secondary lights (shorter range lights found for example at harbour and river entrances). Important details of (especially) primary lights can be found in a reference called the Light List where information (about pedestals etc.) can be found which is not included in the chart. Minor lights on the other hand are likely to be found within harbours, along channels and rivers. These have a low to moderate intensity and sometimes mark isolated dangers. 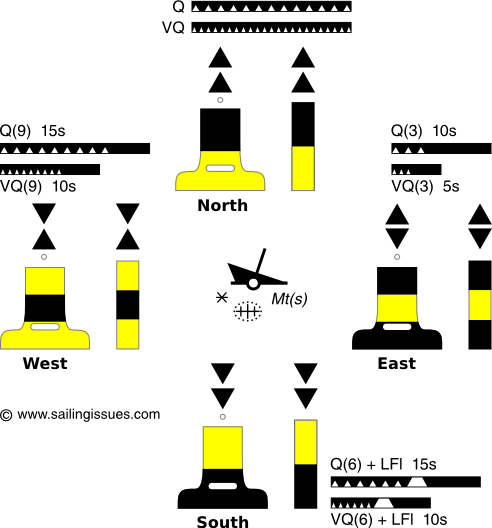 The location of lateral buoys defines the borders of channels and indicates the direction. Under IALA A red buoys mark the port side of the channel when returning from sea. Under IALA B green buoys mark the port side of the channel when returning from sea. See below for the directions of lateral buoys in IALA A and IALA B. Red buoys have even numbers and red lights; green buoys have odd numbers and green lights. Lateral lights can have any calm phase characteristic except FL (2+1). The four cardinal buoys indicate the safe side of a danger with an approximate bearing. For example, the West cardinal buoy has safe water on its West and the danger on its East side. Notice the “clockwise” resemblance of the light phase characteristics. The top marks consist of two black triangles placed in accordance with the black/yellow scheme of the buoy. When a new obstacle (not yet shown on charts) needs to be marked, two cardinal buoys - for instance a South buoy and an East buoy - will be used to indicate this “uncharted” danger. The cardinal system is identical in both the IALA A and IALA B buoyage systems. This type of buoy indicates the position of an isolated danger, contrary to cardinal buoys which indicate a direction away from the danger. Body: black with red horizontal band(s); Topmark: 2 black spheres. The light (when present) consists of a white flash: Fl(2). After the sinking of the “Tricolor” in the Pas de Calais (Dover Straits) in 2002, several other vessels hit the wreck despite standard radio warnings, three guard ships and a lighted buoy. This incident spawned a new type of buoy, the emergency wreck marking buoy, which is placed as close as possible to a new dangerous wreck. Fitted with an alternating blue and yellow flashing light with a nominal range of 4 nautical miles where the blue and yellow 1 second flashes are alternated with an interval of 0.5 seconds. If multiple buoys are deployed then the lights will be synchronized. A racon Morse Code “D” and/or AIS transponder can be used. The top mark, if fitted, is a standing/upright yellow cross . It is important to realize - especially for the colour-blind - that this new buoy breaches the useful and crucial convention: vertical stripes equal safety, horizontal stripes equal danger. I have saved these buoys for last since they lack an actual navigational goal. Most of the time these yellow buoys indicate pipelines or areas used for special purposes. I have drawn the five official IALA shapes, from left to right: conical, spar, cylindrical, pillar and spherical. The seafaring nations of the world - members of the International Hydrographic Organization - agreed in 1982 on an universal set of chart symbols, abbreviations, colours, etc to be used in the nautical chart, in order to obtain uniformity. On regular charts a white, red, yellow or green lights will be indicated by , and on GPS displays and modern multi-coloured charts in specific colours: , with the yellow coloured lobe indicating a white light. The precise position of a chart symbol is its center, or is indicated with a line and circle , the “position circle”. buoys - consisting of a floating object that is usually anchored to a specific location on the sea floor; drawn at an oblique angle and with oblique numbering, descriptions of colours and light characteristics. 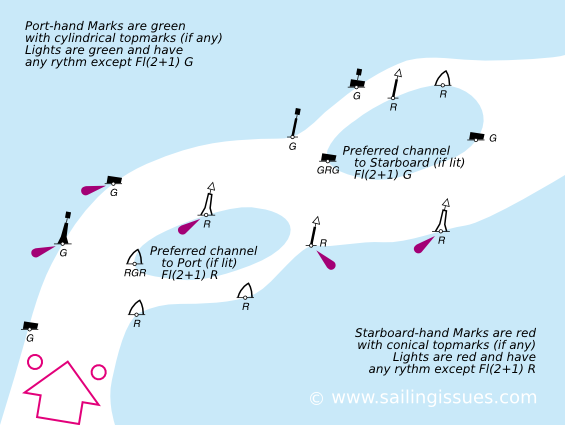 Lighted marks on multi-coloured charts, GPS displays and chart plotters. The black symbol indicates a true radar reflector. Other radar-conspicuous objects - natural or manmade - which are known to give an unexpectedly strong radar response may be distinguished by the magenta symbol. Wave-actuated bell buoy to the left, and to the right a Light buoy, with a horn giving a single blast every 15 seconds, in conjunction with a wave-actuated whistle. Other sounds include “Gong”, “Siren”, “Diaphone” (Dia). The fog signal symbol may be omitted when a description of the signal is given. Leading lights (≠ : any two objects in line under each other). Bearing given in degrees and minutes. The lights are synchronized. The red light has a shorter nominal range (the distance from which the light can be seen): 10 nautical miles. Sector light on multi-coloured charts. The elevation is 21 metres (height of the light structure above the chart datum used for elevations). 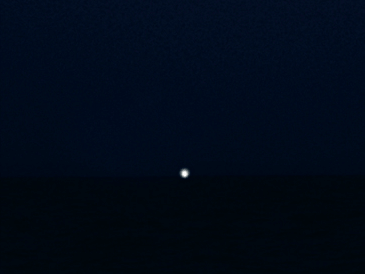 The nominal range of the white light is 18 nautical miles. The range of the green and red light is 12 nautical miles. Main light visible all-round with red subsidiary light seen over danger. The fixed red light has an elevation of 55 metres and a nominal range of 12 nautical miles. The flashing light is white, with three flashes in a period of 10 seconds. The elevation is higher than the red light: 62 metres and the range of the white light is 25 nautical miles. Nominal range(s): white 15 M, green 11 M, red between 15 and 11 M, where “M” stands for nautical miles. Lateral marks are generally for well-defined channels and there are two international Buoyage Regions - A and B - where these Lateral marks differ. 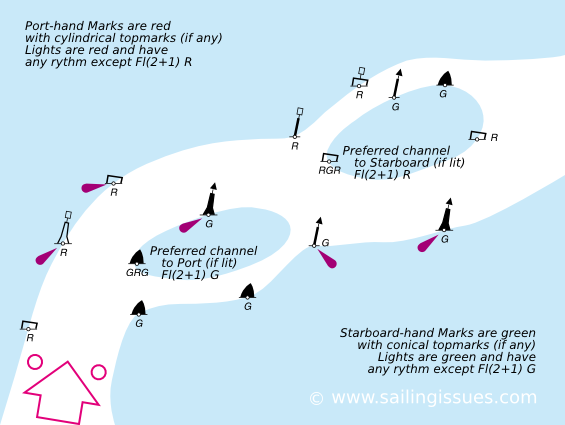 Where in force, the IALA System applies to all fixed and floating marks except landfall lights, leading lights and marks, sectored lights and major floating lights. The standard buoy shapes are cylindrical (can) , conical , spherical , pillar and spar , but variations may occur, for example: minor light-floats . In the illustrations below, only the standard buoy shapes are used. In the case of fixed beacons - lit or unlit - only the shape of the topmark is of navigational significance. The geographic range is based on the elevation of the light. A higher light means that its horizon is farther away, see distance of horizon. Moreover, if the observer's height of eye is higher than sea level the light can been seen beyond its geographic range, the dipping range. However, on sailing yachts this potential is limited. The nominal range of a light is based on its candlepower, and is typically the range mentioned in the chart. The nominal range is the maximum distance at which a light can be seen in weather conditions where visibility is 10 nm. If not stated in the chart, consult the List of Lights or a nautical almanac. if the nominal range is just 5 nm. if the meteorological range is just 5 nm due to a light haze. 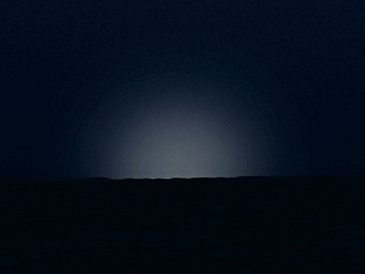 Because of the limiting factor of the geographic range, most major lights will never be seen from a sailing yacht 20 nm away. Yet, it is sometimes possible to take a bearing on the loom of the light: its reflection against the clouds. Different coloured lights with equal candlepower have different ranges. White light is the most visible followed by yellow, green and then red. Therefore, at extreme ranges an “AL WG” can resemble a “Fl W”. The range of a lit buoy is never indicated - with the exception of a LANBY - but on a clear night the maximum range is 3 nm, yet often considerably less. Navigation aid: An onboard instrument, device, chart, method, etc., intended to assist in the navigation. Aid to navigation: A device or structure external to the ship, designed to assist in determination of position, to define a safe course, or to warn of dangers or obstructions. Mark, seamark, navigation mark: An artificial or natural object of easily recognizable shape or colour, or both, situated in such a position that it may be identified on a chart. A fixed artificial navigation mark is often called a Beacon. Lateral Mark: An aid to navigation intended to mark the sides of a channel or waterway. Cardinal Marks: An IALA aid to navigation intended to show the location of a danger to navigation based on its position relative to the danger using the “cardinal point”: north, east, south, west. Light sector: As defined by bearings from seaward, the sector in which a navigational light is visible or in which it has a distinctive colour difference from that of adjoining sectors, or in which it is obscured. Lighthouse: A distinctive structure exhibiting a major navigation light. Light List: A publication giving detailed information regarding lighted navigational aids and fog signals. Landfall: The first sighting (even by radar) of land when approached from seaward. Range: Two or more objects in line. Such objects are said to be in range. An observer having them in range is said to be on the range. Two beacons are frequently located for the specific purpose of forming a range to indicate a safe route or the centerline of a channel. Leading line: On a nautical chart, a straight line, drawn through leading marks. A ship moving along such line will clear certain dangers or remain in the best channel. Range lights, leading lights: Two or more lights at different elevations so situated to form a range (leading line) when brought into transit. The one nearest to the observer is the from light and the one farthest from the observer is the rear light. The front light is at a lower elevation than the rear light. Lights in line: Two or more lights so situated that when observed in transit they define a position: the limit of an area, an alignment used for anchoring, etc. Not to be confused with range lights, which mark a direction to be followed. Light-float : A buoy having a boat-shaped body. Light-floats are nearly always unmanned and are used instead of smaller lighted buoys in waters where strong currents are experienced. Primary (sea-coast) light: A light established for purpose of making landfall or coastwise past from headland to headland. Secondary light: A major light, other than a primary (sea-coast) light, established at harbour entrances and other locations where high intensity and reliability are required. Major light: A light of high intensity and reliability exhibited from a fixed structure (lighthouse) or on marine site (except range lights). Major lights include primary sea-coast and secondary lights. Luminous range: The extreme distance limited only by the intensity of the light, clearness of the atmosphere and the sensitiveness of the observer's eye. Luminous range diagram: A diagram used to convert the nominal range of a light to its luminous range under existing conditions. Charted or Nominal Range: The nominal range is indicated in the chart next to the light or can be found in the Light List. This is the maximum distance at which a light may be seen at night based upon intensity and 10 nautical miles of visibility. Meteorological Range: The meteorological range is based on the current atmospheric conditions. Weather in the form of haze, mist or rain is often a limiting factor in the visibility of the light travelling through it. The meteorological optical range table ranks from 0 (dense fog : less than 50 metres of visibility) to 9 (exceptionally clear : more than 27 kilometres of visibility).